Only A Dog Could Be This Daft! Just look what this dumb Dog did! Rebel an eight month old German Shepherd Dog was heading for trouble when he decided to check out an interesting looking hole in the wall. 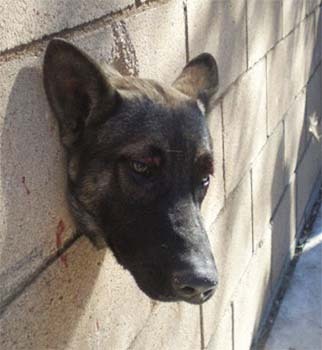 As you can see from the first picture ‘clever’ Rebel somehow managed to squeeze his head into a really small hole in the wall of his garden in Los Angeles, California, and then the curious bone headed bow-wow got his head well and truly stuck. Unfortunately Rebel’s owner was out and it was only when a friend of the owner heard Rebel whining, whimpering and generally expressing a wish not to have his head sticking out of the wall that he found the pitiful pup, in what could be described as “a bit of a tight spot” he took pity on him and called the authorities. County Animal Services officers arrived and decided the Dog was not in serious danger and obviously thought that the dim Doggie was making a song and a dance out of his predicament so they decided that if Rebel could get his head into the hole then he could jolly well get his head out of the same hole – with a bit of help of course. 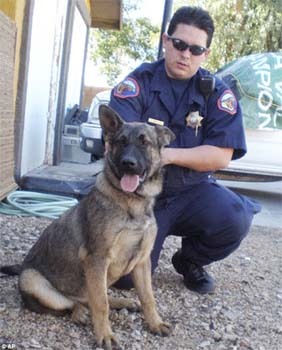 Obviously the County Animal Services officers’ main concern was not to hurt Rebel, with officers on either side of the wall, they tucked in the silly pup’s ears and gently pulled him back and forth for about 30 minutes before they managed to free him. Happily no one, either canine or human was hurt and as you can see from the next picture Rebel seems to have rather enjoyed the experience, proving that Dogs are really very dumb! If you didn’t get my book for Christmas don’t worry there are plenty here Amazon.com or if you want you can order one from my website here www.thecatsdiary.com. I hope that eventually everyone will have a copy of my book ‘Getting Out – Excerpts from a Cat’s Diary’ and not only because that will make me ‘J-K-Rowling-Rich’ but also because unlike Harry Potter my books will make you laugh and therefore the world a brighter place.